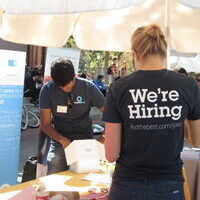 Attend the Spring Career Fair, one of the largest recruiting events of the year! Employers from a diverse array of industries will be on campus to meet and hire you. Note that the Career Fair will be taking place outdoors (rain or shine) on Trousdale Parkway. See you there! The Symplicity Jobs & Careers app allows you to take your job search on-the-go with smart features to easily connect with employers before, during, and after career fairs. Download from the App Store or get it on Google play. Download the app or log in to connectSC to RSVP and view a complete listing of organizations attending the fair. And get a jump on the competition - check out our website to get tips to help you prepare for the fair, polish your resume, dress for success, and network like a pro. This event is well-organized. The staffs are very friendly and helpful.